By Brooke Stuart - Follow Brooke as she studies abroad in Dublin, Ireland. This past weekend I explored Dublin’s outdoor markets and parks. Until a few days ago, I never set out to Temple Bar, Phoenix Park or the Co-op, all which are in close walking distance to my apartment. 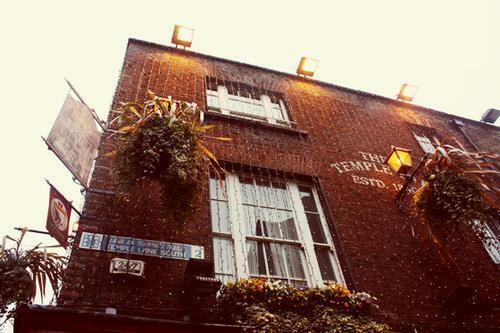 On Saturday morning, my friends and I went to Temple Bar market in search for cranberries, and an adventure. The sun was shining and a nice breeze was carrying the smell of the pastries and fruit right to our noses. I found fresh cranberries for sale, which was great because I was planning on making cranberry bread for the brunch we were having on Sunday. I also bought this incredible raspberry scone my friend and a blueberry one for myself. My friend bought a berry danish and we each tried each other’s. They were absolutely delicious! We headed back to the apartments, making a pact to walk around and try new foods every weekend. I organized an ultimate Frisbee game at Phoenix Park, so a bunch of us met in the lobby of the apartments and headed over to the park. I still can’t believe how beautiful the weather is here. The day was just perfect. The Liffey was sparkling from the sun, the crocuses and the daffodils were out and the sky was so blue. It was amazing. We went to the park and played on the field right in front of the obelisk monument. 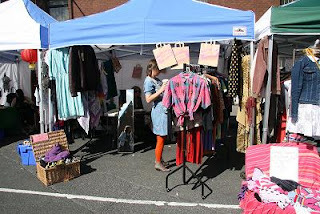 On Sunday, I headed to the monthly flea market down the street from our apartments at the Co-op. There is a massive flea market that is held on the last Sunday of every month. There were so many second hand clothes there that were not expensive at all. One of the first tables we went to was one with clothes, shoes, necklaces and purses. It was a lot to take in. I ended up buying a Topshop dress for only 5 Euro! Finding a great dress for that price made my day. We kept walking around and I soon kept seeing great things that I wanted: Top Gear books, old Hello and Vogue issues, Soccer books, CDs ,even a Darth Vader disco ball! That was a great end to outdoor adventures for the weekend. It was such a great weekend, filled with friends, fun, and beautiful weather.